TAG Heuer and Bamford Watch Department unveil a brand-new interpretation of its iconic Monaco, with its on-trend visual identity making it a contemporary classic. Dubai, UAE, March 24, 2018: The brand new model unveiled at Baselworld by the Swiss watchmaker is the iconic Monaco with a solid carbon case, an elegant full black dial and aqua blue chronograph counters. Never before has such a bold design graced this flagship piece, seminal in the worlds of both watchmaking and motor racing. This interpretation is brand-new, exclusive and unique. The most iconic timepiece in the TAG Heuer collection has been completely reinvented, thanks to a clever collaboration with Bamford Watch Department. CEO of BWD, George Bamford needs no introduction. He pioneered the customisation of luxury watches by modernising and personalising timepieces which were already very exclusive, giving them a recognisable identity with his own ultra-modern, futuristic style. This is not the first collaboration between TAG Heuer and Bamford Watch Department. Back in 2017, customers and fans of the Swiss brand were offered the opportunity to customise their favourite model. 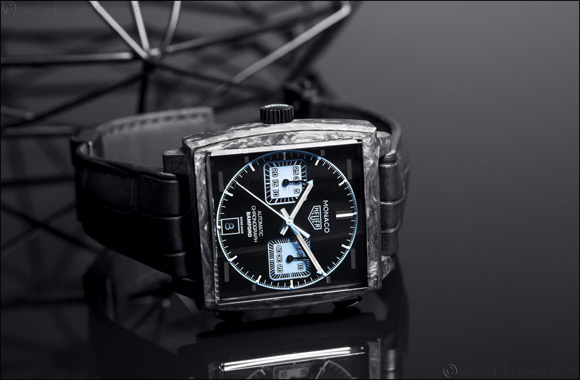 Following this success, TAG Heuer invited George Bamford to help designing this new series of the Monaco, which exclusively carries the Bamford name. Now, George Bamford has left his mark on the legendary TAG Heuer Monaco. As one would expect, this new version still features the hallmarks of this model: the square 39-mm case and the crown positioned on the left. But now it also boasts a case made from incredibly lightweight and highly resistant carbon – the ideal material for watchmakers. Bamford's signature style is evident in the chronograph counters highlighted with luminous marks on the indices and the date window, which are a magnificent aqua blue – Bamford Watch Department's favourite shade of blue – a detail which gives the timepiece a resolutely modern look which is right on-trend. The dial and the case-back are engraved with 'Monaco Bamford' as a reminder of the partners in this collaboration. The whole piece is set off perfectly with an exquisite black alligator leather strap. The result is an ultra-modern visual identity, a contemporary classic. This timepiece has been made possible thanks to TAG Heuer's industrial capabilities: the brand created a special mould for this carbon case to perfectly match the dimensions of the TAG Heuer Monaco and meet the technical constraints of this specific material. The fruit of this partnership, the TAG Heuer Monaco Bamford is the perfect combination of the avant-garde watchmaking and technical expertise of TAG Heuer and the modern flair of Bamford Watch Department. It is symbolic of the brand's investments in maintaining its forward-looking spirit, culture and philosophy, at the forefront of Swiss Avant Garde.